Rainbows are Jenna's favorite thing at the moment. 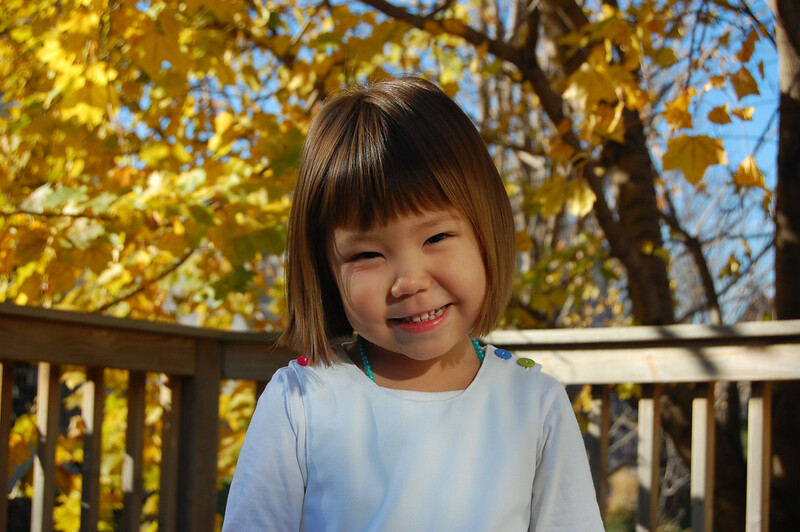 Everything she draws or colors is elevated in her esteem if it has rainbows in it. 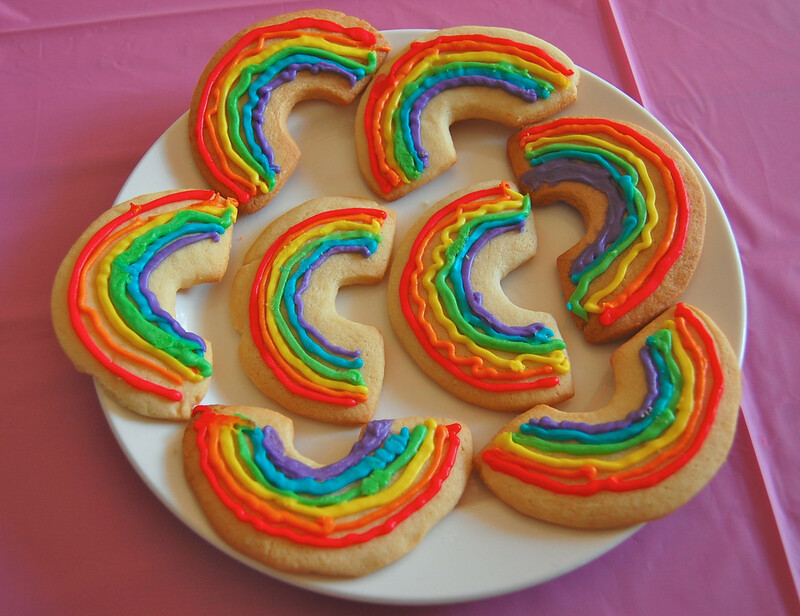 For her birthday, we made these rainbow cookies, even though they had nothing to do with the Rapunzel theme. They made her grin so wide. 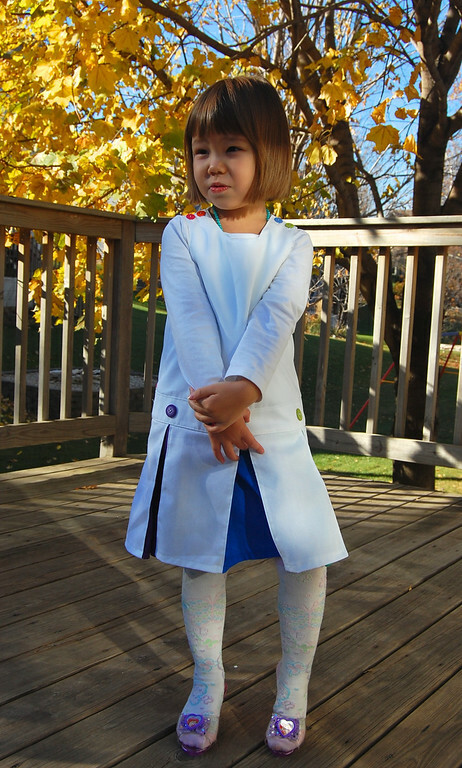 I'd wanted to make Jenna a dress for her birthday so she'd have something new and handmade to wear. When I asked her what kind of dress she'd like, she said "A rainbow dress" and wouldn't elaborate on the design, other than that "I like the rainbow stripes." Nothing came to mind so I sat on it (like everything else). I only knew that I was not about to applique rainbows, clouds or anything motif-y on the dress, nor was I going to be sewing rainbow-stripe trim or doing any rainbowy embroidery. Then I saw Meg's beautiful rainbow dress and showed it to Jenna. And she smiled and got very excited. Lovely! 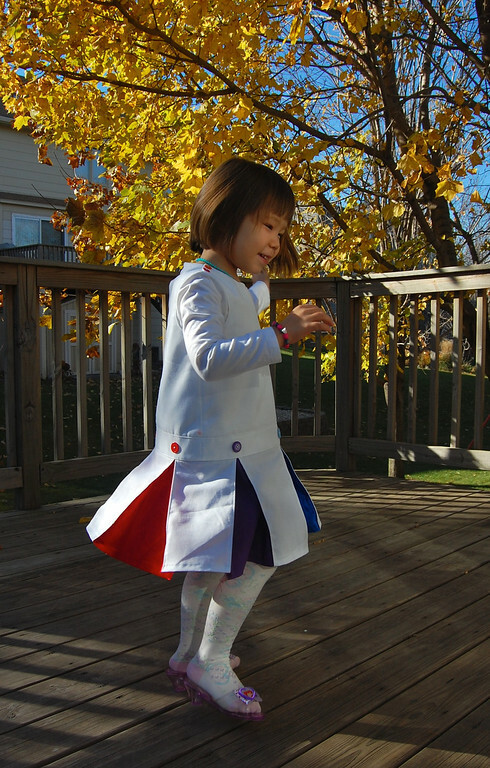 So last week - long past her birthday - I made her Rainbow Dress. Well, in the summer it could be a dress, but it's a pinafore for the cold months now. Part Wimbledon, part cheerleader, part carnival, it's something you have to be four years old to carry off. Technically, it is my favorite dress to date - all those clean, clean lines and old-fashioned styling! 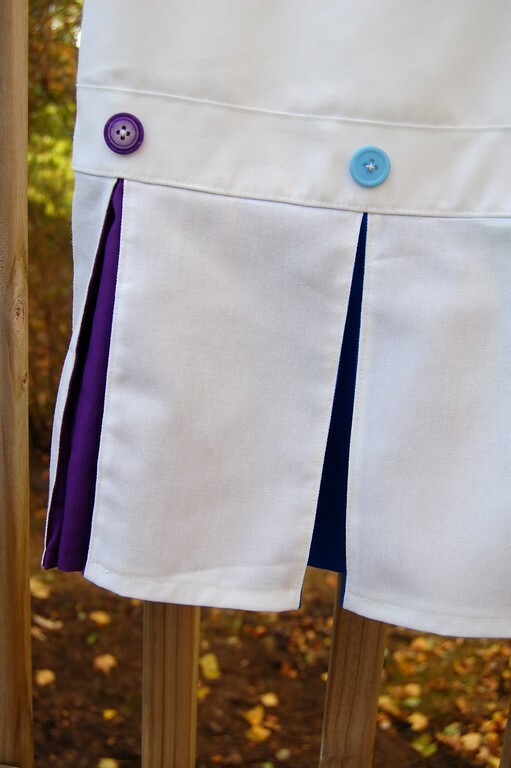 I used white stretch twill and fully lined it with cotton. 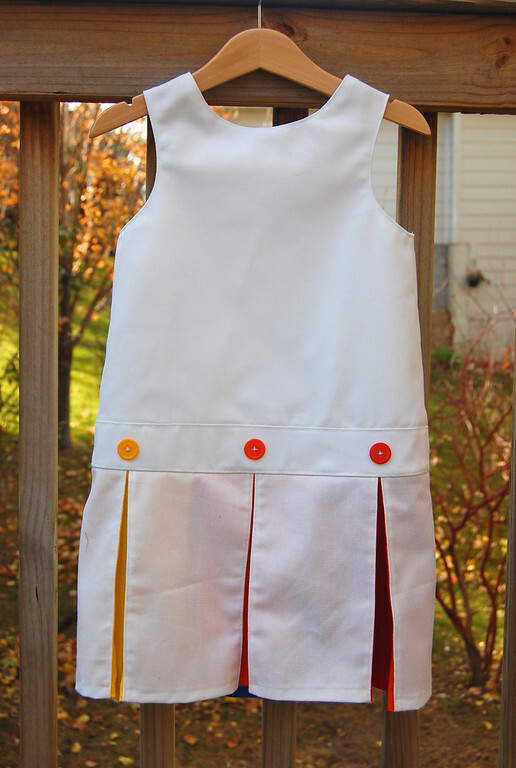 Because the pinafore buttons at the shoulders, facing the whole garment was easy. and a full skirt of inverted box pleats. In spite of being very enthusiastic during the construction stages, Jenna was not very excited about wearing it when it was finished. She explained that it was because the dress was white and "white is not in the rainbow and I like the colored parts but I don't like the white parts". and yelled Hello! to the sky. And that brought her smile back, like sunshine after the rain. P.S. When she accessorizes this dress with her her dangly necklaces, bracelets and dressy slippers, I swear I've been transported back to the 60's. P.P.S. Never mind that this particular rainbow has only 6 colors, which I'm glad Jenna hasn't noticed. The girl notices everything. I think 6 is the right number of colors in a visible spectrum rainbow. Physicists do not distinguish Blue - Indigo or Indigo - Violet. So ROY. G. BIV needs an update. 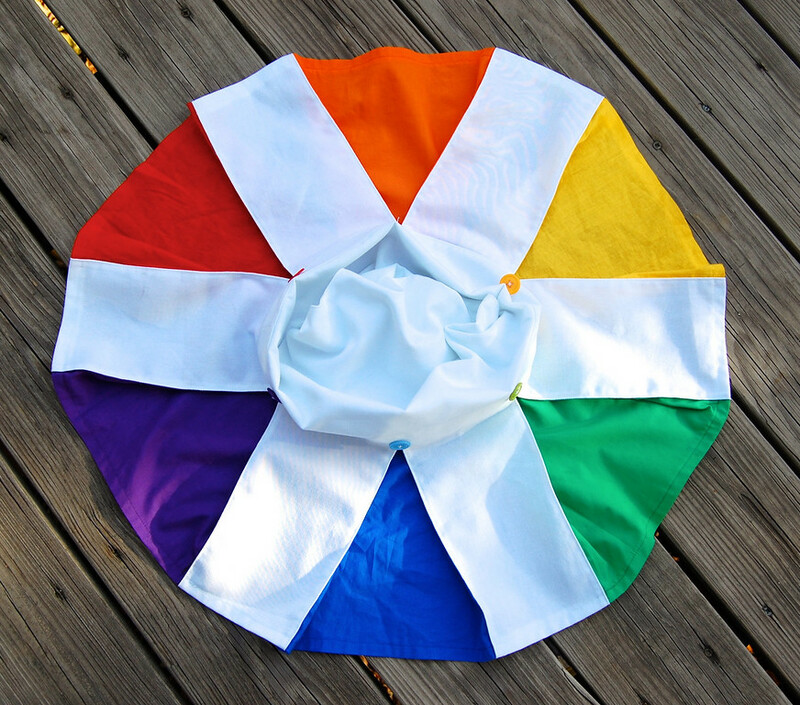 And the rainbow box pleats are awesome! LOVE it!! seriously and absolutely. Back to the 60's for me, too... I used to have a dress with pleats (not rainbow ones, however) at the bottom like that 'way back then! :) Jenna's is so cute, and so are the cookies! I wish I was 4 so that I could wear one, too! I. Oh. I. wow. Speechless. That is the coolest dress EVER! 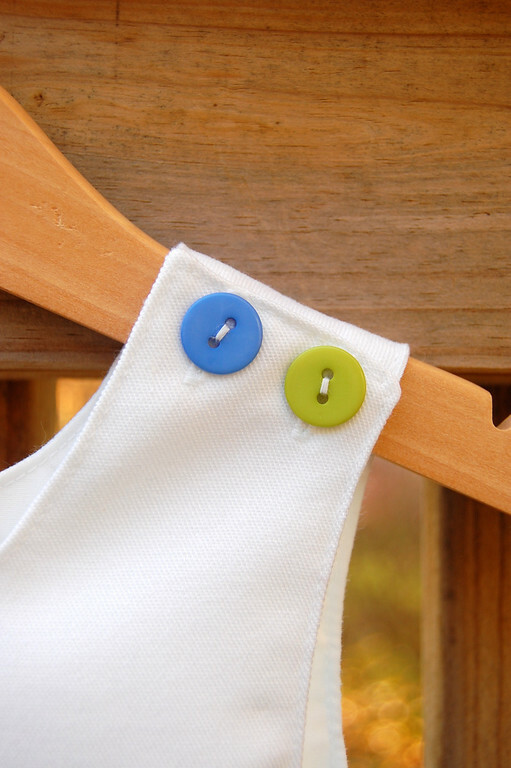 Do your kids actually keep white clothes clean? An audible, take your breath away gasp! For the clouds and the rainbow! oh my gosh! that's so cute! my 5-year old loves rainbows and anything twirly! oh I LOVE IT - and what a stunning photo of her sitting in the center with the rainbow peeking out! You are sooooo clever to rescue the dress with the cloud story. I am in the middle of making a pinafore the exact same way - I am just lining the whole thing and piffle, facings. I find facings very annoying to work with. Gorgeous!!! 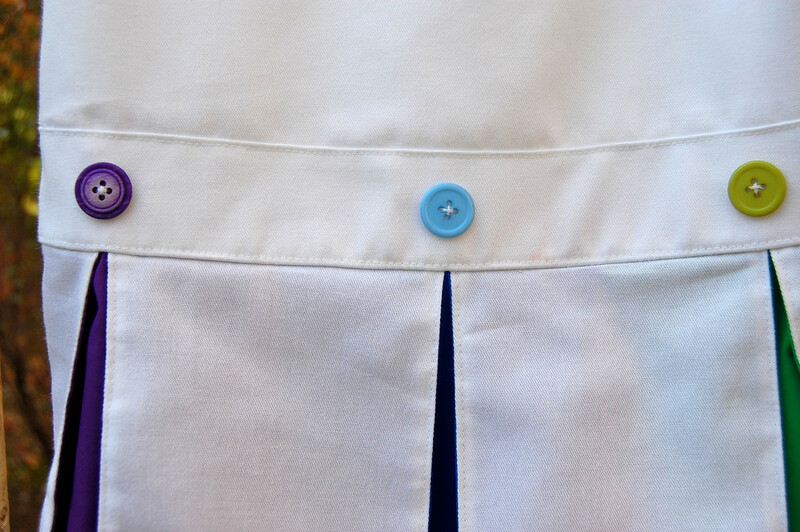 I particularly love the button accents. You are so cool and that dress is perfect. I wish I was you! simply amazing!!!! she is beautiful and the dress is a piece of art!!!! happy bday. Gwendolyn - about the rainbow-6: really? Who would've thought the rainbow needed an update, along with a now-Pluto-less solar system. Good to know Science is dynamic too. 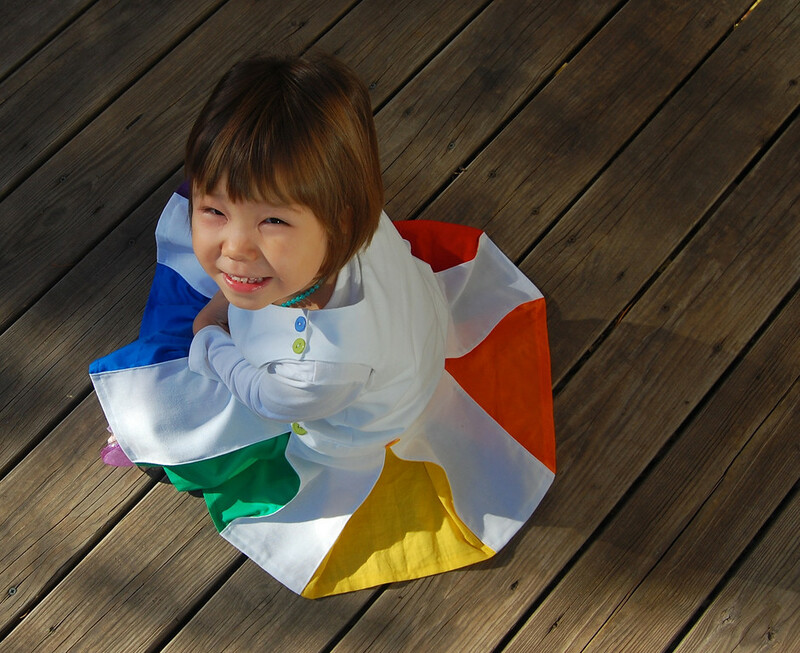 MaryAnne: I don't know how well they do with white, but we're about to find out - Jenna is wearing her rainbow dress in school now as I type this! Paint! Playground! Markers! I wonder if I should get the bleach ready. 6 or 7, I think this dress is perfect ! And her smile, too. beautiful dress. i am constantly being inspired by your entries! thank you for sharing. love the dress! makes me wanna make one but first, need to find how to make box pleats. So cute! 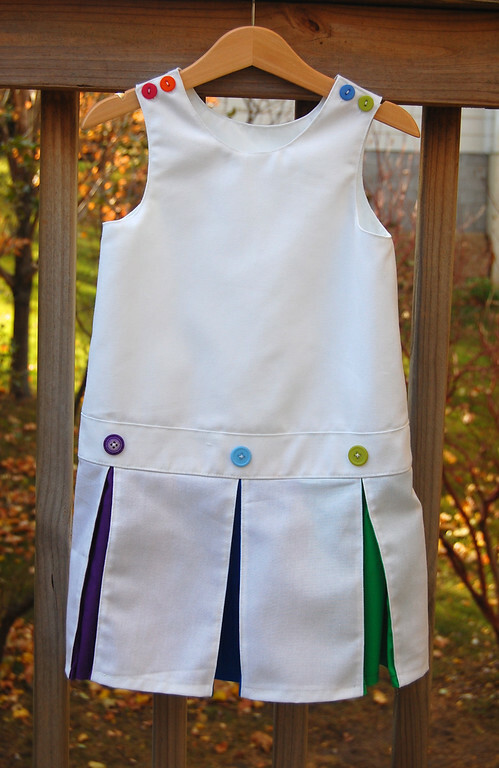 I love how the rainbow is 'hidden' in the pleats of this pretty little white dress! I also LOVE the bird's-eye view! I recently made a rainbow tank dress for my little one (rainbow is her favorite color)... you can check it out at my blog here: http://cottoncandystitches.blogspot.com/2011/06/neon-rainbow-dress-diy.html She would adore one like yours, though! :) Thanks so much for the inspiration!